What’s better than beer and cookies? Beer in cookies! Yeah, you heard us right. 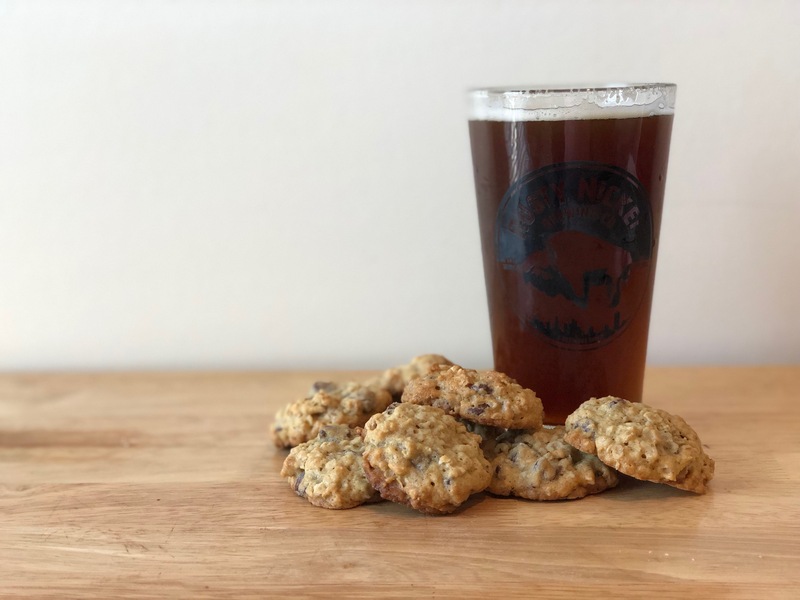 We found a #winning recipe for oatmeal stout cookies and adapted it to use our delicious and local brew – Rusty Nickel Brewing Co’s Oatmeal Cookie Ale. 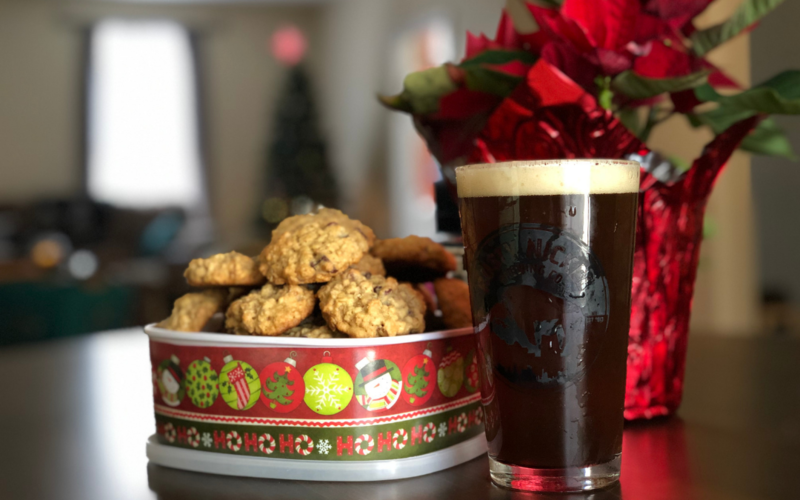 We know – Oatmeal Cookie Ale isn’t a stout. But it works! We 100% encourage you to swing by RNBC’s tasting room and pick up a can to try it for yourself, but any oatmeal stout or ale will do. The most important part of this recipe is that you reduce the beer on the stove before putting it in the cookies. We know you might be tempted to just pour the beer in and go to town, but trust us, it’s worth the wait. P.S. personalize these! If you don’t like nuts, leave them out. If you LOVE chocolate chips, throw them in. Play to your tastes and they’ll turn out great! 1 ¾ cups semi-sweet chocolate chips – or however much you’re feeling that day. Listen to your heart. Don’t let the beer-in-cookies thing freak you out. It’s going to be great. Put the beer in a pot on high heat and let it reduce by half. This should take about 30-40 minutes. When it’s reduced, remove it from the heat and let it cool. Preheat the oven to 350 degrees and line your baking sheets with parchment paper. (If you don’t have parchment paper, no worries, we used baking sheets with a very light layer of cooking spray). In the bowl of a stand mixer (or in a bowl with a hand mixer, or just a good old fashioned bowl and spatula) cream the butter and sugars. Add ⅓ cup reduced ale and vanilla, mix. In a different bowl, mix flour, baking soda, baking powder, salt, and oats. Pour dry ingredients into wet, and mix. Add your chocolate chips and walnuts. Scoop cookies onto baking sheets. 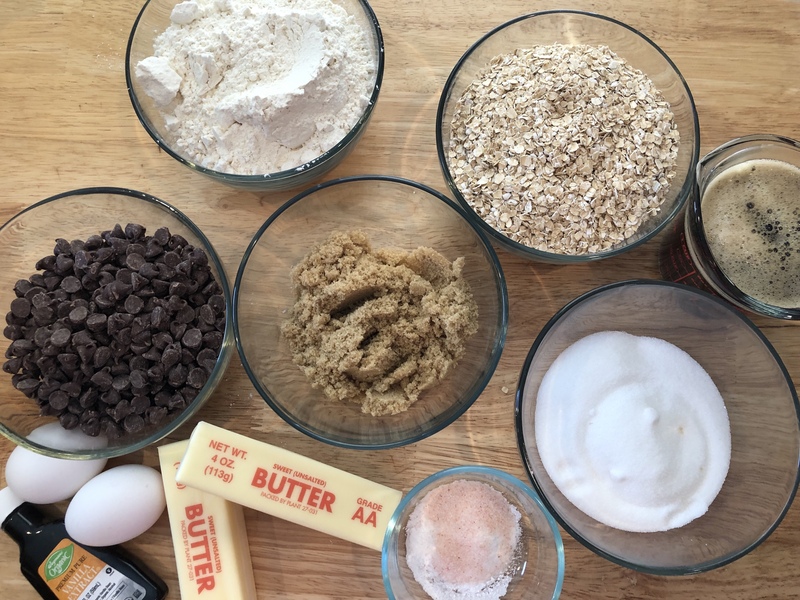 (We used about a ½ tablespoon for each because we like to eat lots of smaller cookies, but you can do a full tablespoon, too!) about 1 inch apart. Bake about 10 minutes. The cookies should be lightly browned on the bottom. Make sure not to leave them in too long or they won’t be as chewy. Let them cool about 5 minutes on the baking sheet and then about 5 minutes on a cooling rack. Wrap them up and bring them to your cookie exchange! © 2018 Content on Draft | All rights reserved.